The flip-up design is pretty cool. For the past year, the only two contenders in the PC virtual-reality space were the Oculus Rift and the HTC Vive. Not anymore. A few days ago, LG announced its own PC-driven VR headset, which was made in collaboration with Valve. That means that there are now two headsets -- the Vive and the LG -- that make use of Valve's SteamVR tracking technology. I took a closer look at a prototype of the LG headset here at GDC 2017, and though it could certainly use some improvement, it has a lot of potential. 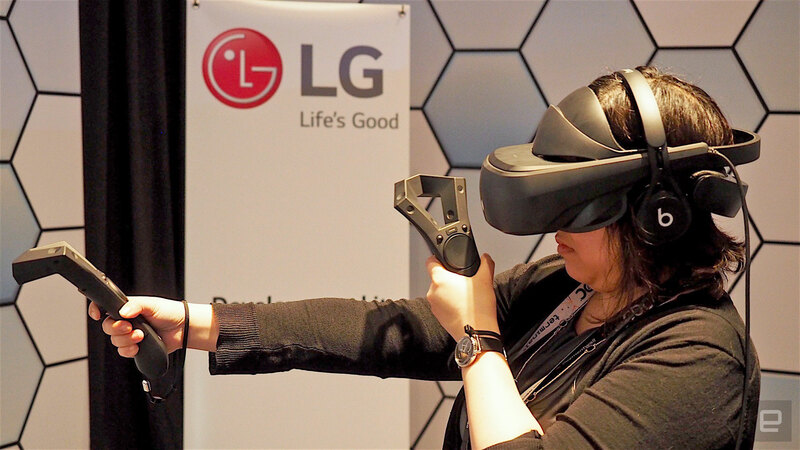 LG's SteamVR headset is not a small device by any stretch of the imagination. From some angles, it actually looks more like a helmet than a headset. Its design is not unlike the PSVR, with an all-plastic build that encompasses everything from the eyepiece to the headband that holds it in place. There's a nice smooth surface on the front of the goggles -- a stark contrast to the HTC Vive's pockmarked face. But if you hold the LG headset to the light, you're able to see the various sensors beneath the smooth veneer. Also on the front is a camera lens, which LG says would be used for pass-through view eventually. You put on the LG headset by wearing it as if it were a backwards baseball cap, with the rear band wrapping around the back of the head and the front piece pointing upward. You can then tighten it around your head by ratcheting the sides in, and by adjusting a scroll wheel on the back. It all feels comfy and snug, like it's giving your skull a bear hug. It did loosen a little bit during gameplay, however, which could be due to the headset's considerable heft shifting slightly as you move around. One design detail I particularly appreciate is that you can extend the eyepiece, flip it up and then bring it back down over your eyes again without much effort. This makes jumping in and out of virtual reality that much easier, which could be useful if you have kids and pets running around, or if you just need a quick sip of water in between killing alien invaders. The wand controllers look similar to the Vive's, but with ends that are angular and blocky instead of circular. They also feel nicer, thanks to a textured grip on the sides that make them easier to hold. 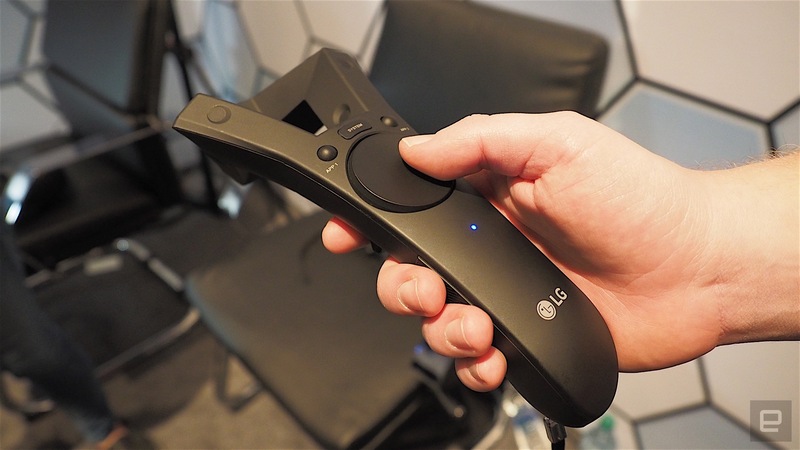 It's also similar to the Vive in that the LG headset uses the same Lighthouse tracking tech Valve developed -- LG even made its own base stations. Seeing that both headsets were made to Valve's specifications, the similarities aren't too surprising. According to LG, the headset has a 3.64-inch display with a 1,440 x 1,280 resolution for each lens, a refresh rate of 90Hz, plus a 110-degree field of view. Right now, the IPD can't be adjusted, there are no built-in headphones and, as we said, it's a little heavy. But it's only a prototype; LG has said it's open to changing the design as it receives more user feedback. I tried the LG SteamVR headset for only about 15 minutes, but I was suitably impressed. I batted an electric racquetball around, played a longbow minigame and watched an abstract ballerina twirl its way around me. The display quality is great, and the screen-door effect (visible pixels) was minimal enough that after a while I forgot it was there. The reaction times from me flailing around the controllers were on point as well. On the whole, it made a pretty notable first impression. The design is impressive for a prototype, and the performance is good, too. A lot could change between now and when it comes to market, of course, so we'll have to wait and see if the final LG headset can take on the competition. Unfortunately, that might take a while: LG won't say how much it costs or when it's expected to ship.